This issue of Sonic finally kicked off the new series for me. It sets a light-hearted tone far apart from the war-torn dystopia that the previous entries painted. Sonic heads over to the next town (very convenient all these towns are right next to each other). Once there, he finds out he is too late. Too late for the action. Knuckles has already taken down a Super Badnik with his bare, knuckles. The town they are in is locked down by order of some supposed town leader. Walls and locked doors are no match for Sonic and his “cool ‘tude”. He and Knuckles scale the wall of the town and make their way to the leader, to see why everyone in town seems so afraid. As it turns out, the leader is not just one person. We finally meet the new characters teased in the last issue. Meet Rough and Tumble, the skunk brother duo, leftover mercenaries from the war with Eggman. They’ve taken over a Wispon storage depot and are using the Wisps to keep the townsfolk hostage. The fight between Sonic and Knuckles and Rough and Tumble in this issue was the best yet. Not just for fluidity between panels or for any suspenseful action, but for a great combo of the scuffle and classic Sonic banter. Rough and Tumble finish each others sentences and rhyme occasionally. Sonic has to hold back laugher because their tough-guy routine is pretty corny. Knuckles takes them seriously because he isn’t very good at catching anything humorous. This isn’t because Knuckles is a hulking dolt like he was in the Sonic Boom series, it’s just because his character is historically pretty stony. Of course, this issue cannot end without a cliff hanger, once more. The unknown evil (aided by the only likeable Sonic Boom characters, and Eggman cronies, Orbot and Cubot) notices Knuckles is away from his usual post at the floating Angel Island. I like that this series is combining different characters and places from different series in the comics and games. 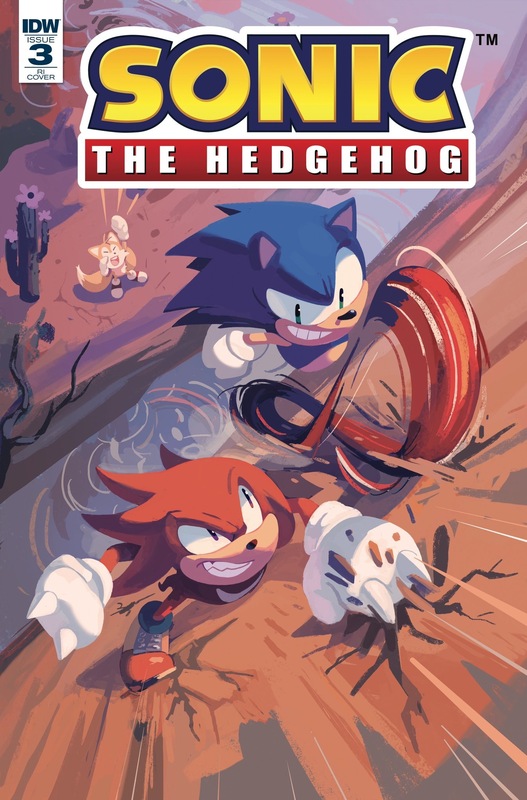 In the vein of combination, this issue was the perfect combination of what makes Sonic the Hedgehog fun, action packed and enduring.